These are Irish Wild Geese Black Rubber moulds that can be reused hundreds of times to cast 40mm scale metal semi-flat soldiers. No assembly is required after casting these figures. It is important to prime these figures before painting them. Irish Wild Geese Uniform information from Hugh Morton. As part of the Treaty of Limerick in 1691, the Irish forces of Patrick Sarsfield, who had fought the army of William of Orange to a standstill, were given the option of sailing to France to join the Stuart King, James II, in exile. Shortly after Sarsfield signed the Treaty of Limerick a French fleet arrived with reinforcements and many urged Sarsfield to tear up the Treaty and fight on. This he would not do; having given his word of honor, he kept it. Believing they had negotiated a treaty that guaranteed the rights of their people, perhaps as many as twenty thousand Irish soldiers sailed with Sarsfield to France. The treaty that Sarsfield had honored would never be honored by the British. With cruel irony they would tear up the treaty and replace it with the Penal Laws, stripping Irish Catholics of their land, persecuting them for their religion and removing every right of citizenship. On this note of dishonor and betrayal began the saga of "The Wild Geese." For the next hundred years the French Army would include an Irish Brigade which began with Sarsfield's soldiers, and the men of Justine MacCarthy (Lord Mountcashel) who preceded them, was fed by a continual stream of young men from Ireland. "Cuimnidh ar Luimneach agus ar Feall na Sasanach!" -- Remember Limerick and the Saxon Faith (i.e., English betrayal) -- became a battle cry of the Irish Brigade in the service of France. Though some may have joined foreign armies looking for adventure, others to make a living, many were looking to fight the ancient enemy, England. It has been estimated that as many as half a million or more Irishmen died fighting for France in the century after Limerick. The majority of the recruits came from the counties of Clare, Limerick, Cork, Kerry and Galway. French ships which arrived on the west coast smuggling in brandy and wine would depart with recruits for the Irish Brigade. In the paper work of the ships, the recruits would be listed as "Wild Geese," thus the origin of the name. In 1745, after France's Irish Brigade was so instrumental in the famous victory over the British at Fontenoy, England's King George II would express a sentiment many British soldiers would have reason to second over the years: "Cursed be the laws which deprive me of such subjects." Though the term "Wild Geese" is usually used for the men of the France's Irish Brigade, France was not the only destination of these "Wild Geese. " 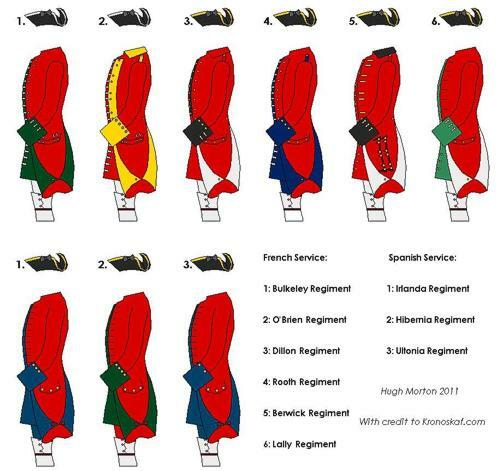 Many went to Spain, where Irishmen had actually been serving for many years in great numbers, forming a number of regiments in the Spanish army. Irishmen served in the Armies of Austria, Russian, Poland and the various German Kingdoms. Many of the "Wild Geese" rose to prominence in the Armies of Europe. George Brown of the Austrian Army, was made a Field Marshal by Emperor Charles IV and 11 different men named Walsh became Field Marshals or Generals there. Francis Maurice Lacy, was a Field Marshall in the Austrian and Russian Armies and many reached high commands in France and Spain. A McMahon became Minister of War and President of France. These "Wild Geese" fought in battles all over Europe and the world through the years. In South America Bernardo O'Higgins became the Liberator of Chile and Admiral William Brown, from Mayo, became the Father of the Argentine Navy. Members of the Irish Brigade of France served as Marines with John Paul Jones on the "Bonhomme Richard" and others were at Yorktown with Rochambeau. The Hibernia regiment of Spain fought the English at Pensacola, Florida in 1781. And many thousands of Irishmen were already here in America, 17 of them rose to be generals in the Revolutionary army, no less "Wild Geese" than the others, fighting in great numbers to do in America what they and their fathers could not do in Ireland: Throw off the oppressive yoke of England. During the American Civil War, six grandsons of George McCook, a United Irishmen, were Union Generals and another six were field officers. Irish-born Meagher, Corcoran and Shields were Union Generals and for the Confederacy, Corkman Patrick Cleburne was one of their finest commanders. More that 150,000 Irishmen served in the US army, most notably with the Irish Brigade, and some 50,000 more worn the grey of the Confederacy. Fifty three percent of the 600 Nuns who served as nurses during the War were born in Ireland, and no doubt many more were Irish-American. For our purposes on this page, we will give all exiles of the Gael the proud name of "Wild Geese." And we will cover the history of Ireland as well, for it is the history of Ireland, the history of all the millions driven from their land by famine and oppression, that led to the existence of all the "Wild Geese."